Nearly 6 million Americans can’t vote because of discriminatory felon-disenfranchisement laws. After finishing a probation sentence for cocaine possession in 2008, Kelli Jo Griffin of Montrose, Iowa, was told by her lawyer she was once again eligible to vote. The 42-year-old mother of four cleaned up her life and took her 13-year-old stepdaughter with her to vote in a local election in 2013. Unbeknownst to Griffin, Iowa Governor Terri Branstad had revoked the automatic restoration of voting rights for ex-felons in 2011, and Griffin was ineligible to cast a ballot. Griffin was prosecuted by then–Iowa Secretary of State Matt Schultz for knowingly lying on a voter-registration form, with a penalty of 15 years in jail. The jury deliberated for less than 40 minutes before acquitting Griffin. “I’m glad I can go back to being a mother,” she told The Des Moines Register. However, Griffin still couldn’t vote in future elections, even after paying her debt to society. In 2014, she filed suit with the ACLU against Iowa’s felon-disenfranchisement law. Iowa is one of only three states, along with Florida and Kentucky, that permanently ban ex-felons from voting. Today the Iowa Supreme Court ruled against Griffin in a 4-3 decision, blocking 20,000 ex-offenders from having their voting rights restored. The Iowa Constitution bars “a person convicted of any infamous crime” from voting, which the court’s majority said applied to Griffin’s sentence. “In the end, we are constrained to conclude that all objective indicia of today’s standard of infamy supports the conclusion that an infamous crime has evolved to be defined as a felony,” wrote Iowa Supreme Court Chief Justice Mark Cady. In 2005, Democratic Governor Tom Vilsack ended Iowa’s longstanding felon-disenfranchisement policy, issuing an executive order automatically restoring voting rights to ex-offenders who had completed their sentences. The move enfranchised 115,000 voters over the next six years. But Vilsack’s Republican successor, Governor Terry Branstad, immediately revoked the executive order after taking office in 2011, ruling that ex-offenders could only have their voting rights renewed after personally applying for reinstatement by the governor. From 2011 to 2015, more than 25,000 ex-offenders have completed their sentences, but only 119 people have had their voting rights restored by Branstad. The notion that allowing Griffin to vote will render the ballot box impure, disrupt the electoral process, or damage institutions of democratic governance is fanciful at best. I posit there is no legitimate basis for concluding Griffin’s vote will have any such adverse effects; and precluding her vote will, in my view, advance no compelling government interest. Because many of these disenfranchised felons—like Griffin—were convicted of crimes having no relationship to the integrity of the electoral process or other democratic institutions, I believe a negative societal impact has occurred. Voting encourages persons to become informed about and involved in their communities’ civic affairs—behaviors that maximize the chances of rehabilitation for those convicted of crimes. Disqualification, on the other hand, stigmatizes felons and undermines their reintegration to society by treating them as second-class citizens even after they have served their prison sentences. This is a much bigger issue than just one case in Iowa. Nationally, 5.85 million Americans can’t vote because of felon-disenfranchisement laws, including 2.2 million African Americans. 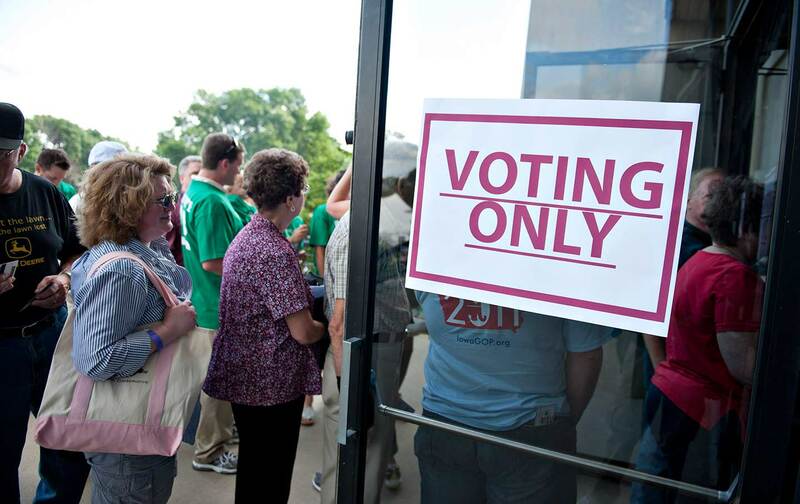 Such laws disproportionately target people of color, in Iowa and elsewhere—one in every 13 African-American citizens has lost their voting rights because of felon-disenfranchisement laws, while this has happened to only one in every 56 non-black voters. “In 2014, African-Americans represented 3.4 percent of Iowa’s population but 26.2 percent of the state’s prison population,” found the NAACP Legal Defense Fund. Researchers at the Sentencing Project estimate that approximately twenty-five percent of African American males in Iowa are disenfranchised by the legislature’s implementation of article II, section 5. The exclusion of ex-felons in Iowa has produced a disenfranchisement rate for African Americans in Iowa that is “more than triple” the national rate. States like Iowa are increasingly out of step with places like Maryland and Virginia, which have recently restored voting rights to ex-offenders (Republicans are challenging Virginia’s executive order in court). But conservative-dominated courts continue to be a major impediment to voting rights. In the span of 12 hours, as MSNBC’s Zack Roth noted, courts upheld Iowa’s felon-disenfranchisement law, a voter purge in Ohio, and proof-of-citizenship laws in Kansas, Alabama, and Georgia. But in 2016, the first presidential election in 50 years without the full protections of the Voting Rights Act, too many of these efforts are succeeding.